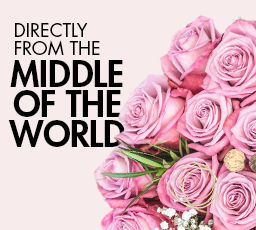 Ready-to-use premium arrangements for wedding ceremonies made with preserved, natural roses; and DIY Centerpieces of fresh roses for wedding receptions. This DIY wedding arrangement combines FAIR TRADE, fresh roses (15), ruscus (3), statices (3), and asparagus (2) of white and ivory tones. With proper care, this delicate centerpiece can last up to 12 days. * Includes some free spare roses in case you need to replace a damaged flower. Learn DIY florist tips for creating dream-wedding centerpieces. If you require different quantities, send us a message. We’ll be pleased to help you. This DIY piece of wedding décor combines FAIR TRADE, fresh roses (15), gypso (3), and leather fern (2) of light pink, salmon, light yellow, and champagne tones. With proper care, this beautiful centerpiece can last up to 12 days. Learn DIY florist tips for creating dream-wedding centerpieces..
DIY packs of premium fresh roses, fillers and greens for tabletop centerpieces. Every pack was designed and inspired in the eternal spring of Ecuador. This DIY centerpiece has FAIR TRADE, fresh roses (15) cocculus (3), and green hypericum (3). It combines bright yellow, dark pink, purple, and dark orange tones for creating an outstanding piece of wedding décor. This gorgeous centerpiece can last up to 12 days.